On Friday evening, 6/29, eastern Maryland was hit by a fierce storm, knocking out power and tree limbs in the area, and at my house in particular. Of course the temperatures were in the mid-90’s, making it an even more pleasant experience. So with such warm temperatures and no power, things in the freezer began to thaw out. By the time power was restored on Monday 7/1, we had some meat that had to be eaten before it went bad. Now after being without power for a few days, and spending most of those days clearing limbs, sticks and leaves from the yard in the hot sun, I was a little tired, so my first thought was, “let’s just cook them”. But I had purchased those 2 items with specific intentions and I hated for them to be wasted. I also realized it has been a while since I’ve posted something, so I thought a power outage feast post was in order! I had purchased a DryGlaze mix from Urban Accents (my favorite spice blends). It is called Vermont Grill and features Maple and Sage. I have used this on Salmon before and it is really delicious, but I wanted to try it on some beef. 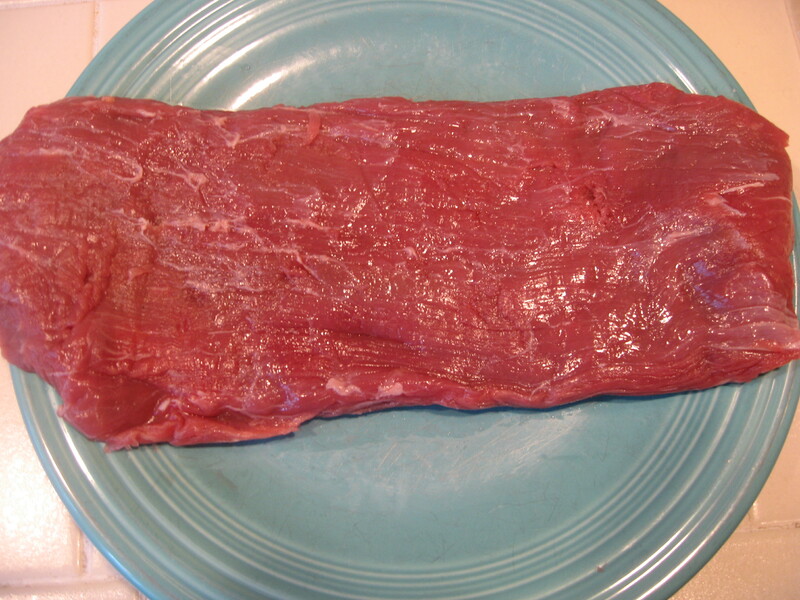 I had thought that the Buffalo Flank Steak would be a good option to try it on. Using the DryGlaze is really easy. Coat the meat with Olive Oil, then sprinkle on the DryGlaze mix. Place it into a plastic bag and let it sit. By the way these are the directions on the package, so nothing special here. 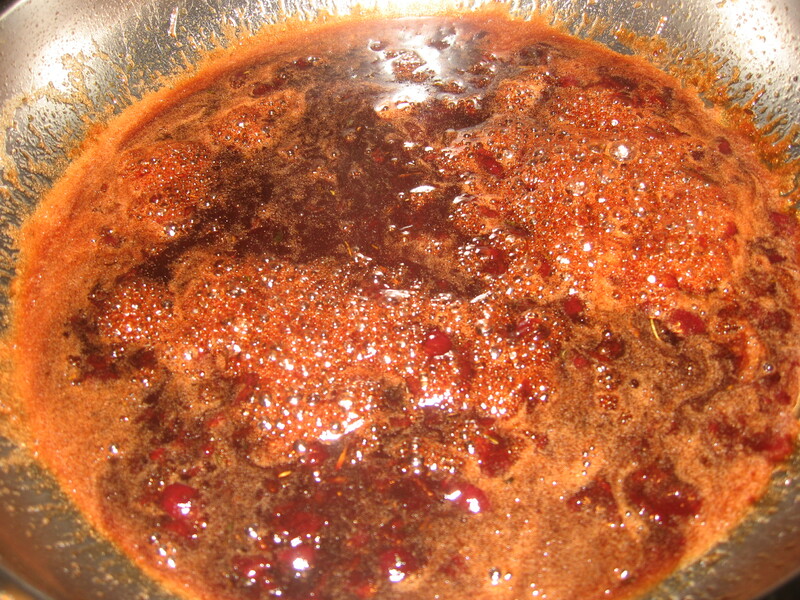 After about 30 minutes, the mix has formed a “glaze” on the meat as the sugar has melted with the oil. I pulled the meat out of the bag and placed it on the grill. Now with all of the sugar in the DryGlaze, you should avoid high direct heat as it will burn. So I put the burner under the meat on low, set the other burners to medium and closed the lid. When the meat reached 130 degrees (medium rare), I pulled it off the grill, tented it with foil and let it sit. 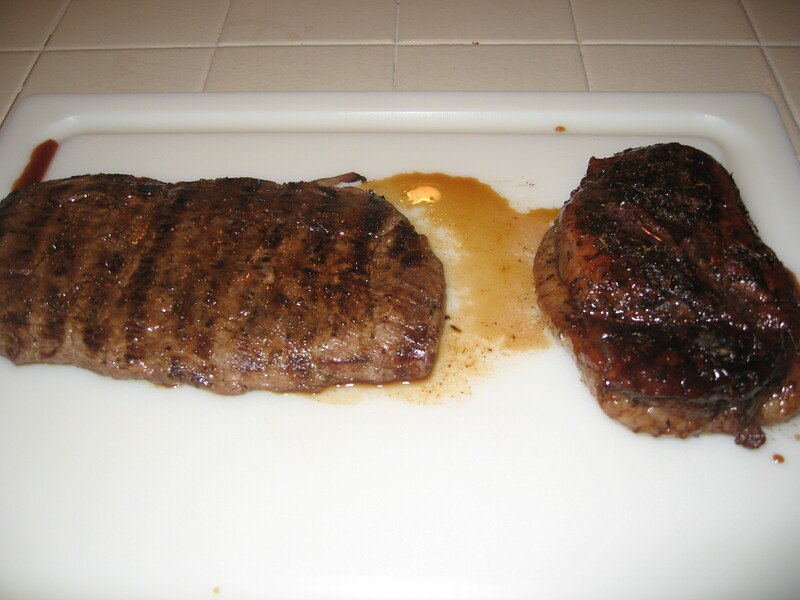 Now this Vermont Grill DryGlaze may be sweet with a maple flavor, but it also packs a little heat (from past experience), so I wanted something cooling to eat with the flank steak. I took an Avocado, peeled it and placed it in a bowl. I mashed up the Avocado with a fork until it was a paste. Next I squeezed the juice from half of a Lime into the Avocado and mixed it up. I also added a little salt and pepper for taste. This wasn’t a very complex accompaniment, but I was hoping it would tame the heat a little bit. 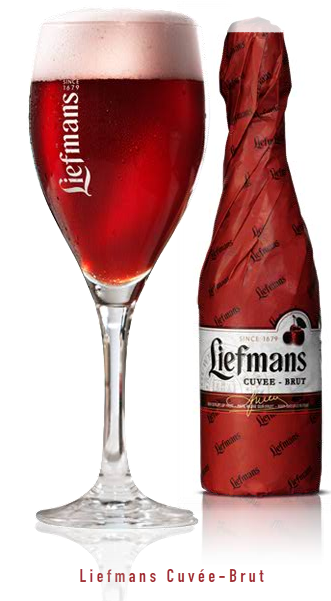 At a beer tasting a few months ago, I tried a Belgium ale made with Cherries called Liefmans Cuvee Brut. It was a little sweet for a drinking beer, but I imagined it would be great to poach a duck breast in. So I bought a bottle along with a duck breast planning to make it one day. 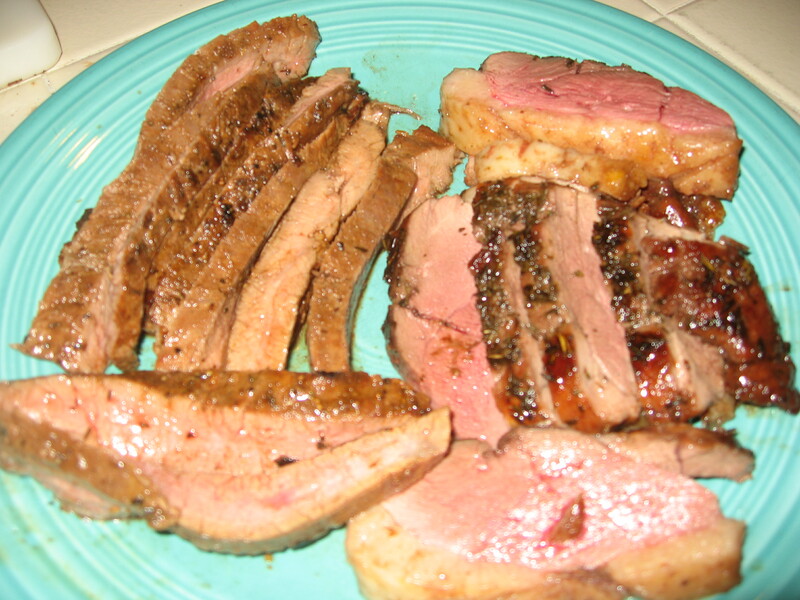 I prepared the duck breast by making several cuts in the fat side of the meat. This allows the fat to escape I assume. 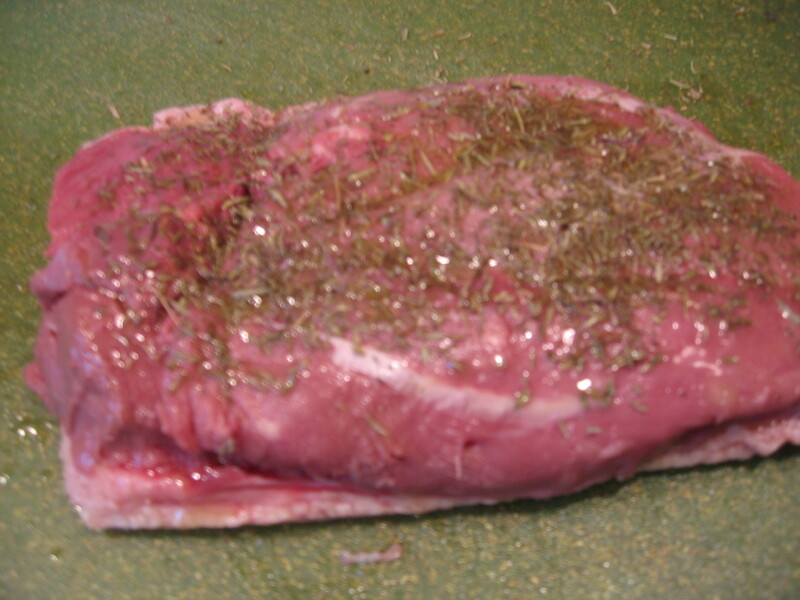 I also coated the meat side of the duck breat with some Thyme and some Savory leaves along with a little salt and pepper. In a frying pan I poured about a quarter inch of the Liefmans ale and started heating it over medium heat. 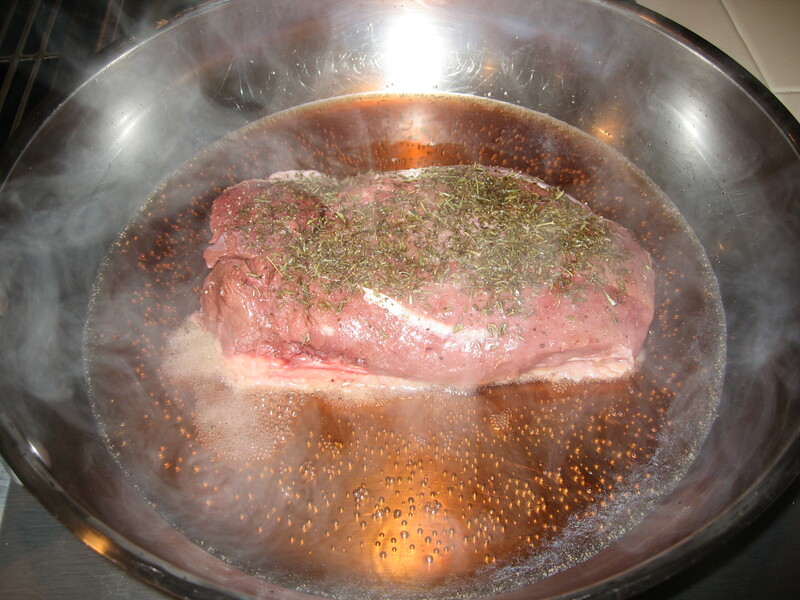 Once it began to steam, I placed the duck breast in the pan, fat side down. This time I placed a splatter screen over the pan, after my last duck breast experience when it splattered everywhere. I cooked the duck breast for about 5 minutes, then turned it over to cook the meat side. The ale had begun to evaporate, so I refilled the pan to a quarter inch of ale. After another 5 minutes I flipped the duck breast again and added more ale to the pan. I did this a couple of more times until a meat thermometer registered 130 degrees (medium rare), then pulled the duck breast out, tented it with foil and let it sit. The frying pan had a little of the ale left along with some duck fat. So I added a little more of the cherry ale, then added 3 tablespoons of Cherry Preserves, stirring over medium heat to incorporate it into the sauce. 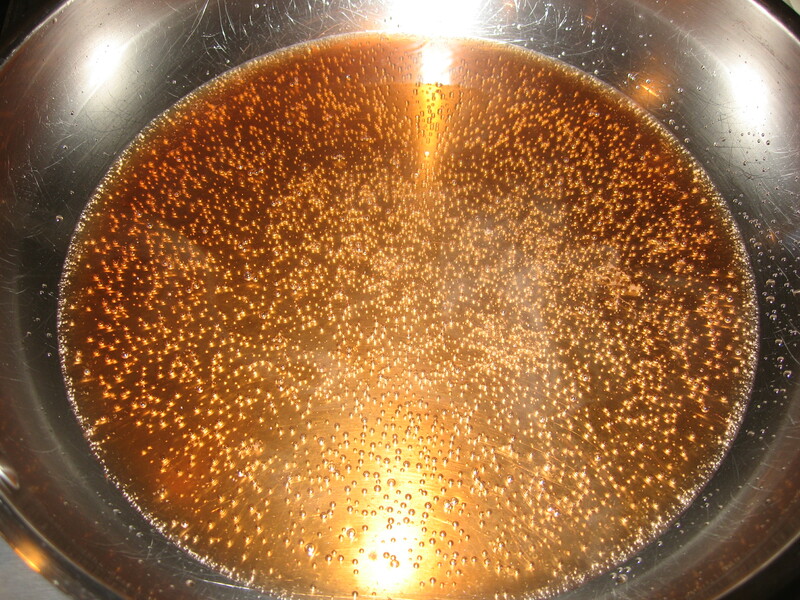 I brought the sauce mixture to a boil, reducing it slightly. Next I added 2 tablespoons of Balsamic Vinegar to the sauce and mixed it in, again reducing it slightly. I pulled it off the heat and poured it into a small pitcher. The Buffalo Flank Steak was really good. 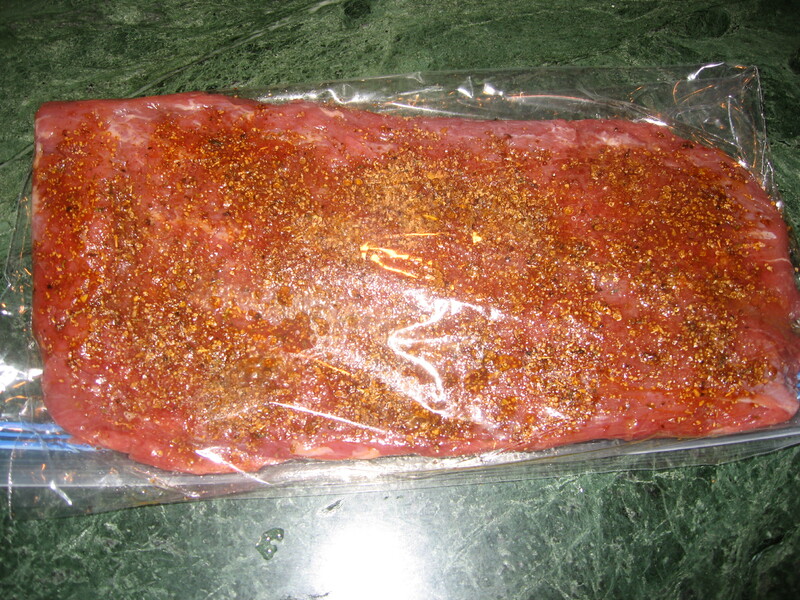 It was leaner, more tender and more flavorful than any beef flank steak I have ever had. The Vermont Grill DryGlaze did not really show up however. I barely tasted any of the Maple flavoring which was disappointing. The Avocado accompaniment was a nice change of pace with the meat though. Very refreshing after a hot couple of days. Wow! The Duck Breast was fantastic! Cooking it in the ale kept it nice and moist and gave it a slight cherry flavor which worked really well with the dark duck meat. The sauce was the real star however. It was great by itself, it was great on the duck, it was even good on the Flank Steak! The duck fat and Balsamic added an earthiness and savory flavor to the sweetness of the cherry preserves and cherry ale. I could pour that sauce on anything. Definitely a keeper of a recipe. This meal had a lot of flavors going on, so it was going to be a little challenging to pick a wine. I wanted something fruity and juicy to go with the fats in both meats. The cherry sauce was going to be the most dominate flavor of the meal, so I needed to be sure the wine would stand up to that too. So I decided to go with a California Zinfandel which can be very fruity and jammy. They also sometimes have a “brambly” character which I thought might pair well with the Flank Steak. I picked a Neal Zinfandel from Napa Valley. 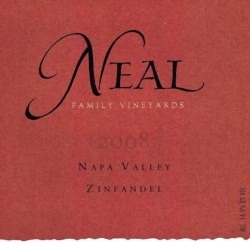 The Neal family makes really good wines that are remarkably affordable for Napa Valley wines. I find their wines show the characteristics of the grape without being overdone. Some Zinfandels can be so over-extracted that they are almost like syrup, which was not what I wanted for this meal. The Neal Zinfandel went really well with the duck and cherry sauce and was also good with the flank steak. I probably could have poured a Cabernet Sauvignon with the flank steak and it may have paired better, but the Zinfandel worked too. The Power Outage Feast was a complete success!